872 pages | 643 B/W Illus. Using realistic examples from everyday life, including sports (motion of balls in air or during impact) and vehicle motions, Applied Dynamics emphasizes the applications of dynamics in engineering without sacrificing the fundamentals or rigor. The text provides a detailed analysis of the principles of dynamics and vehicle motions analysis. An example included in the topic of collisions is the famous "Immaculate Reception," whose 40th anniversary was recently celebrated by the Pittsburgh Steelers. The book addresses two- and three-dimensional Newtonian mechanics, it covers analytical mechanics, and describes Lagrange’s and Kane’s equations. It also examines stability and response analysis, and vibrations of dynamical systems. In addition, the text highlights a developing interest in the industry—the dynamics and stability of land vehicles. In addition to the detailed coverage of dynamics applications, over 180 examples and nearly 600 problems richly illustrate the concepts developed in the text. Designed for classroom instruction appealing to undergraduate and graduate students taking intermediate and advanced dynamics courses, as well as vibration study and analysis of land vehicles, Applied Dynamics can also be used as an up-to-date reference in engineering dynamics for researchers and professional engineers. 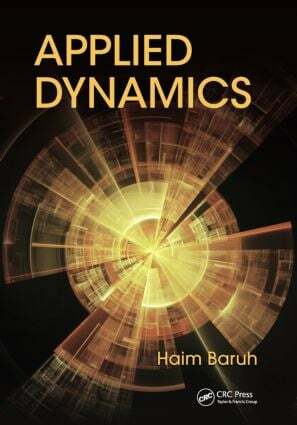 "The book is a classical and detailed introduction to applied engineering dynamics and it is also a nice treatise on the analytical mechanics—holonomic and nonholonomic mechanical systems, especially kinematics and dynamics of the rigid bodies and vehicle dynamics. … useful tool for undergraduate and graduate students, professors, and researchers in the area of theoretical and applied mechanics and mechanical engineering. … a valuable addition to this field and probably will serve as a reference for a long time." "Overall, this is an excellent book and highly recommended. The coverage of the topics is wide-ranging, which makes it suitable for both undergraduate and graduate courses on dynamics. What makes this book truly different from the rest are the applications of the dynamics principles to real-world systems, such as vibrating systems and vehicles." "The combination of applications with theory without compromising either one is excellently done! Also, the unified and fresh approach to dynamics is excellent. …This book is like a breath of fresh air…"
"This text has a thorough coverage of both introductory and advanced topics in dynamics while focusing on topics useful for solving practical problems, including many associated with the design of ground-based vehicles." "The book presentation is very practical and the text flows nicely. Easy to read with a physically pleasing layout of text and figures. I really appreciate the appearance of the text!!!! --- after all, this is an ENGINEERING book!!!! The numerous examples are very helpful to the student." Which Wheels Will Slide First? Haim Baruh has over 30 years’ experience in teaching and research associated with motion analysis and its applications, such as vibrations, control general dynamics, impact mechanics, and vehicle dynamics. Author of over 40 peer-reviewed research articles, as well as the highly-regarded book, Analytical Dynamics, and director of a NASA-funded successful STEM education center, Baruh’s educational and research efforts have been supported by NASA, NSF, and the FAA. He has collaborated on research with the U.S. Army and he has served as graduate program director and associate dean in the School of Engineering at Rutgers, the State University of New Jersey.